You can still run your favorite older apps in Fusion's virtual environment. When Apple released OS X Lion, it changed the license agreement to allow customers to run both the client and server versions of Lion in a virtual environment. The only caveat was that the virtualization application had to be running on a Mac. That was good news for some, mostly developers and those in the IT industry who need to run server environments. For the rest of us, it didn't seem like such a big deal, at least not until VMware, one of the leading developers of virtualization software, released a new version of Fusion. Fusion 4.1 can run Leopard and Snow Leopard clients in a virtual environment on the Mac. Why is this important? One of the major beefs many Mac users have about Lion is its inability to run older applications that were written for PowerPC processors. This lack of support for pre-Intel apps caused quite a few Mac users to forego upgrading to Lion. Now that it's possible to virtualize Leopard or Snow Leopard in VMware Fusion 4.1 or later, there's no reason not to upgrade to OS X Lion. You can still run your favorite older apps in Fusion's virtual environment. Shortly after VMware Fusion released version 4.1 it came to their attention that the Apple license changes did not affect OS X Leopard or Snow Leopard, and only allowed virtualization of OS X Lion client software and later. VMware made changes in subsequent versions of the Fusion app that prevents virtualization of any client version of OS X that predates OS X Lion. If you have the original 4.1 version of Fusion, these instructions will still work. Otherwise, if you need to run Leopard or Snow Leopard in a virtual environment, you can do so using the server version of the operating system which is allowed to run in a virtual environment. In this step-by-step guide, we're going to show you how to install a fresh copy of Snow Leopard in a VMware Fusion 4.1 or later virtual machine. If you wish to install Leopard instead, the steps are very similar and this guide should serve to walk you through the process. One last note before we begin. There is a remote possibility that VMware could remove this capability in the near future if Apple objects loudly enough. If you're interested in virtualizing Leopard or Snow Leopard, we recommend purchasing VMware Fusion 4.1 as soon as possible. An installed copy of VMware Fusion 4.1 or later. A Snow Leopard install DVD. At least 15 GB of free space for the Snow Leopard installation. A drop-down sheet will appear, asking you to verify the license. Screenshot courtesy of Coyote Moon, Inc.
VMware Fusion makes it easy to create a new virtual machine, but some things aren't quite straightforward, especially for adding Leopard or Snow Leopard client OSes. You will be presented with a Finder sheet that you can use to specify the location for storing the Snow Leopard VM. Navigate to where you want to store it, and then click Save. VMware Fusion will start the virtual machine. OS X Snow Leopard will automatically start the installation process, just as if you had booted from the install DVD on your Mac. Pressing the ‘Continue’ button is the final step of the installation. Screenshot courtesy of Coyote Moon, Inc.
Now that we have the Fusion VM set up, the Snow Leopard installation process will start automatically. You will move through the standard OS X Snow Leopard installation process, starting with selecting the installation language. Make your choice and click the right arrow button. The Install Mac OS X window will appear. Use the menu at the top of the window to select Utilities, Disk Utility. Select the Macintosh HD drive from the list of devices on the right-hand side of the Disk Utility window. In the right-hand pane of the Disk Utility window, select the Erase tab. Leave the Format drop-down menu set to Mac OS X Extended (Journaled) and the name set to Macintosh HD. Click the Erase button. You will be prompted to confirm that you wish to erase the drive. Click Erase. Your Macintosh HD drive will be erased. Once this process is complete, use the menu to select Disk Utility, Quit Disk Utility. The Install Mac OS X window will reappear. Click the Continue button. A drop-down sheet will appear, asking you to agree to the license terms for OS X. Click the Agree button. Select the drive where you wish to install OS X. There will only be a single drive listed, called Macintosh HD. This is the virtual hard drive that Fusion created. Select the drive by clicking on it, and then click the Customize button. You can make any changes you wish to the list of software packages that will be installed, but the one change you should make is to place a checkmark in the Rosetta box. Rosetta is the software emulation system that allows older PowerPC software to run on Intel-based Macs. Make any other desired changes, and then click ​OK. The installation process will take anywhere from 30 minutes to an hour, depending on the speed of the Mac you are using. Once the installation process is complete, there's one more thing you need to do. Eject the install DVD from within the virtual machine. 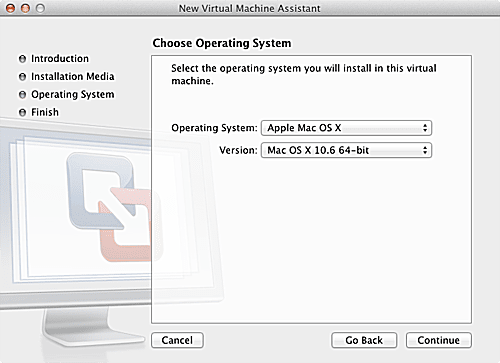 Install the VMware Tools, which will allow the VM to work seamlessly with your Mac. They also let you change the display size, which we recommend doing. The VMware Tools will mount on the VM desktop. Double-click the VMware Tools installer to start the installation process, and then follow the onscreen instructions. You may see a warning message, telling you that the CD/DVD drive is already in use and the VMware Tools disk image can't be mounted. This can happen because we used the optical drive during the Snow Leopard installation process, and sometimes a Mac won't release control of the drive. You can get around this problem by making sure that the Snow Leopard install DVD has been ejected and then restarting the Snow Leopard virtual machine.